Click on a product below for more information. 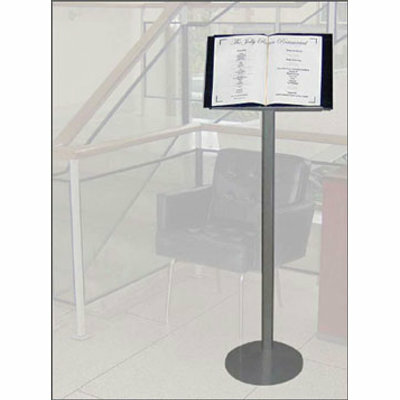 A3, Display Stand - Our free standing menu holder, with lip on edge to ensure menu/book does not slip, is suited to hotels, restaurants etc. 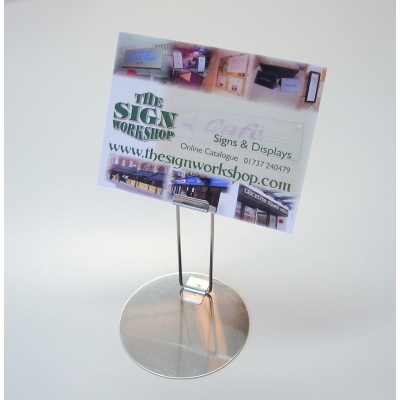 This display stand has a steel base for stability. Height 1400mm, Weight 12.5kgs. Also available in Black. Health and Safety is an important issue so why not make it a feature. Our unique and stylish floor signs in high quality stainless steel with antique brass effect finish, size 750mm x 290mm, come with a rubber surround handle and protective feet. Choose your option of double sided caution legends with a high visibility flourescent logo making sure your message is both clear and elegant. Designed and manufactured from our workshop in Surrey under Certificate of registration design no. 6041678 awarded from the Patent Office. 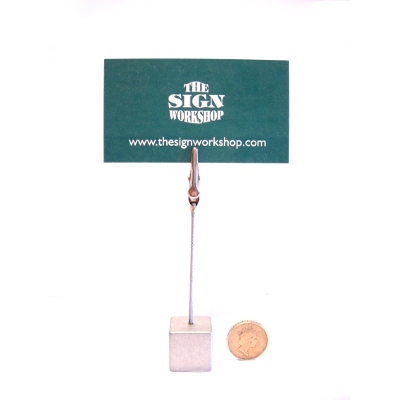 Company name or logo can be added to personalise your stands, just send us your artwork. 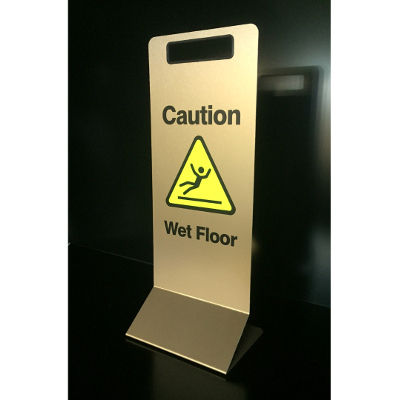 Our unique and stylish floor signs in high quality stainless steel with brushed brass effect finish, size 750mm x 290mm, come with a rubber surround handle and protective feet. 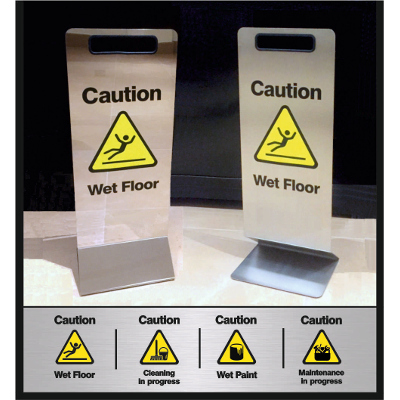 Our unique and stylish floor signs in high quality brushed stainless steel, size 750mm x 290mm, come with a rubber surround handle and protective feet. Choose your option of double sided caution legends with a high visibility fluorescent logo making sure your message is both clear and elegant. 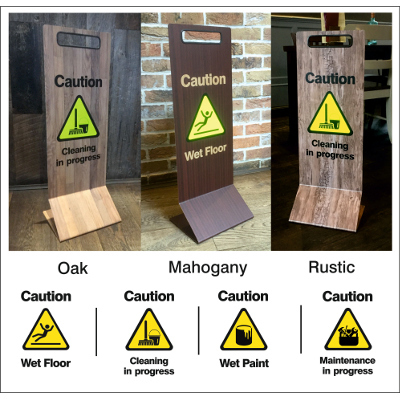 Our unique and stylish floor signs in high quality stainless steel with wood effect finish, size 750mm x 290mm, come with a rubber surround handle and protective feet. 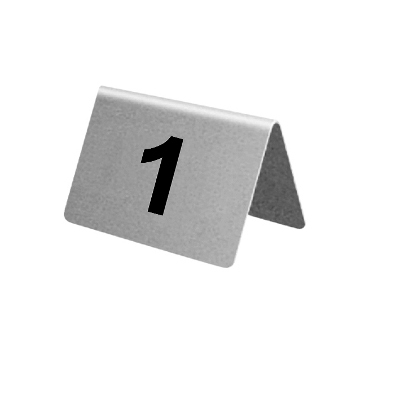 Stainless steel Countertop Card Holder, 100mm high, with clip for your price/display details. Ideal for hot counters. Stylish Crocodile Clips with silver base, 20mm x 20mm and total height of 110mm, used to display Point of Sale Material, menus etc. This item is supplied in packs of 10. 1-10, 11-20, 21-30, 31-40 and 41-50. Suitable for pubs, restaurants and hotels.